One of the fundamental issues in American urbanism is the changing geography of poverty. American cities are famous around the world for having abandoned large portions of the central core, largely unthinkable in Europe and much of the world. Even if suburban historians are doing their best to remind us that poverty — along with economic, social and ethnic diversity — has always existed in suburbs, shifts in recent decades are fundamentally changing metropolitan life in many parts of the country. In an earlier post, I showed some preliminary maps of race and foreclosure in the San Francisco Bay Area. 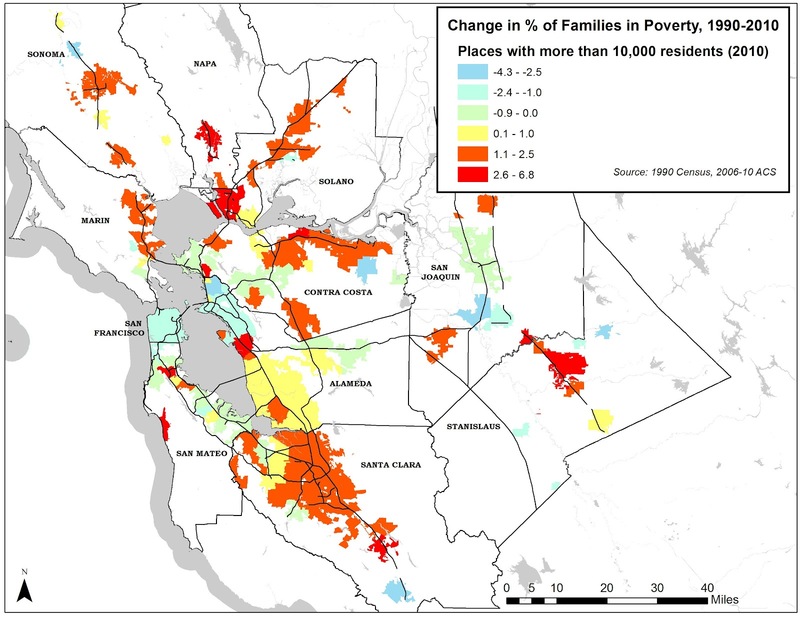 The following two maps roughly show how poverty has evolved across the greater Bay Area in the past two decades. They are based on data from the 1990 and 2006-2010 American Community Survey. They are consistent with an excellent report by Matthew Soursourian that examines changes from 2000 to 2010 at a smaller geographic scale. The map above shows the ratio of families living in poverty in 2010 to 1990 in places with populations above 10,000 in 2010. The blue regions are areas where the number of poor families dropped. You can see how the core of the region, and virtually all of the San Mateo County coast between San Francisco and Santa Clara County, lost poor families while 95 cities gained roughly 25,000 poor families. The second map shows changes in the family poverty rate between 1990 and 2010. In blue and green areas, the rate went down, while red, orange and yellow regions saw an increase. 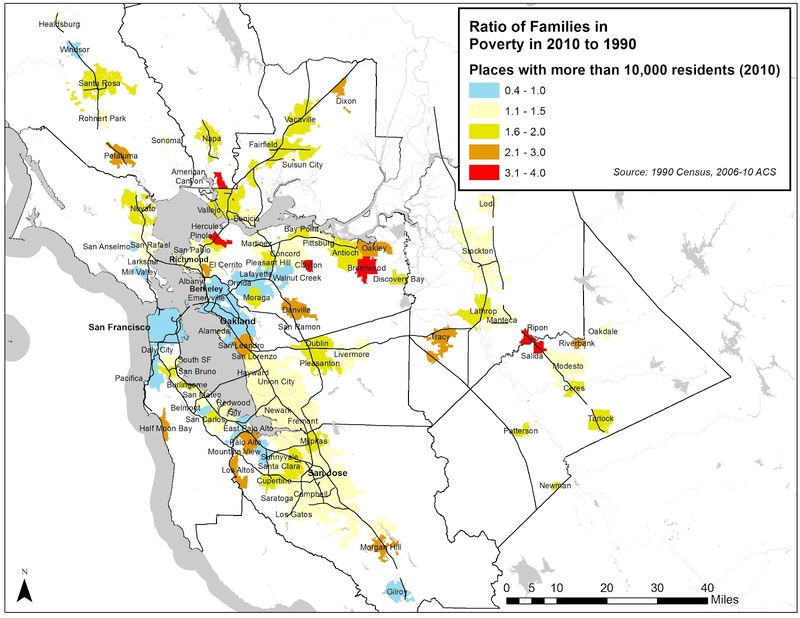 Interestingly, many cities in Santa Clara County, at the heart of Silicon Valley, saw a slight uptick in the percentage and number of poor families, in contrast with the peninsula and San Francisco. 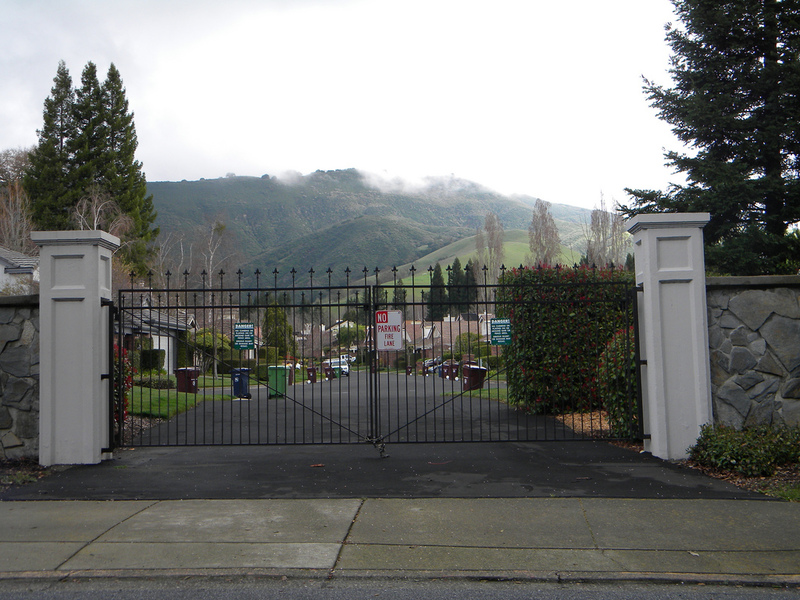 The data for wealthy Marin County are similarly surprising. Together, the maps show something very important: Cities like Brentwood, on the eastern edge of Contra Costa County, are red in the first map and blue in the second. While the city transformed itself from a small farm town to a booming suburb, the percentage of poor families dropped significantly. But during this time it gained more than 450 poor families, straining resources in a subregion with poor transit access and limited social services. The Bay Area is certainly an exceptional place, but the suburbanization of poverty is evident in virtually every American metropolis. What it precisely means is also a difficult question. On the one hand, the fact that the city of Oakland no longer has half of the families in poverty of an entire region is a good thing, both for the city and for the region. For some poor families, this move has meant more peace and quiet, safer streets and better schools. But this does not mean that poor families are going everywhere equally — as you can see, they head primarily to a series of outlying, fast-growing suburbs, rather than to the wealthy and exclusive suburbs that ring the Bay. Exclusion is not what it once was during the days of racial covenants, but this does not mean that inclusion is shared equally. Nor are poor families necessarily finding more job possibilities or a more economically or environmentally sustainable life — commuting statistics for the outer suburbs show a heavy dependence on expensive, long-distance car travel. Moreover, services for low-income families in suburban locations can be severely lacking compared to central-city locations. For some in the urban policy business, the changing geography of poverty in America is an excuse to argue about the efficacy of this program or that, or the more foundational debate about whether the government should be assisting poor families to suburbanize, whether in the name of opportunity or to reduce concentrated poverty. Yet what this now decades-old trend should be doing — especially when combined with a foreclosure crisis, constant fiscal crisis at the local level, rising inequality, persistent problems of environmental injustice, ad nauseum — is forcing us to rethink the politics of urban and regional development as a nation. There has never been a better time for a leader who can end the "place wars" between cities and suburbs, a leader who can make people realize that the just and sustainable development of our regions is the center of a 21st-century economy and that sustainability, fiscal sanity, social justice and our longterm future are fundamentally urban and suburban questions. This is what I meant when I wrote that I was searching for a metropolitan president back in October. If we want to understand how America was built, to borrow a slogan from the Republican convention, perhaps we should be talking more about how America was actually built, for better or for worse, rather than ideological questions with little basis in reality. I get a sense that President Obama understands this, but he has resisted making urban and suburban policy central to his campaign and administration, likely out of fear of being branded too "urban" in a nation still unwilling to think openly and critically about what cities and suburbs really mean. But there is still time to change, or at least I hope so. I'm currently writing a senior thesis on the suburbanization of poverty and economic development models. Would you mind if I contacted you privately somehow? Also what kind of software did you use to create these spatial visual maps? They're really great. Thank you for the article! You can find contact info for the author, Alex Schafran, here: www.alexschafran.com. Good luck with your project!